A replacement would be good but how I would return you the wrong device? And how the refund would work? Yes the address is fine. Thanks for writing to us at Amazon.com with your concern. If we issue refund, you’ll receive refund in 2-3 business day. You can return the item to return address given below. Please write the reason for your return on a slip of paper, put the slip in the carton, and wrap the package securely. I’d like to reimburse you for the return shipping costs. Unfortunately, we weren’t able to determine this expense. Please write back and let us know what you paid for return shipping so that we’ll be able to credit you the correct amount. Please let us know whether you’d like to have refund or replacement. So that we’ll take appropriate action. Thank you for your patience and understanding. We appreciate your business and hope that we will see you again soon at Amazon.com. Thanks a lot for getting back to me quickly. I’m in Bangladesh now and checked with DHL, they says the cost of shipping would be around $50+ Do you still think I should ship it back to you? Because it seems to me very expensive. I completely understand your concern. To make things right for you, you can send the item back and you can also sent the scanned copy of the return receipt and we will immediately issue a full refund. On a personal level, I highly appreciate your patience, cooperation and understanding in this matter. It is our privilege to have you as our valued customer & we want to make sure you are always taken care of. Please be rest assured that we are here to make things easier for you and we’ll take every action to prevent you from bearing any loss. Thanks for your cooperation. We look forward to hearing from you soon. I will work with DHL and update you. But do you have any DHL/FedEX account which I can use to return the product? In that case I would not have to pay anything, DHL/FedEX could charge your account directly. Please send the item back to us via an economical air mail method and let us know what your return shipping costs were with a scanned copy of the return receipt . We’ll then refund you this expense. Unfortunately; we don’t have any DHL/FedEX account at this time. However thanks for your suggestion. Customer feedback like yours is very important in helping us continue to improve our website and services. I appreciate your thoughts, and will be sure to pass your suggestion along. I cannot airmail that to you. Country restriction. Have to FedEx or DHL, which is expensive. Will that do? I do understand your concern about the return. There is no need to concern about the return, Since your are unable to return the item using airmail then you either use FedEx or DHL to return the wrong item back to us. We would like to reimburse you for the return shipping costs. Unfortunately, we weren’t able to determine this expense. Please write back and let us know what you paid for return shipping so we may credit you the correct amount. Once the carrier has received your item, it can take up to two weeks for us to receive and process your return. See our Returns options for details (http://www.amazon.com/help/returns#receive). 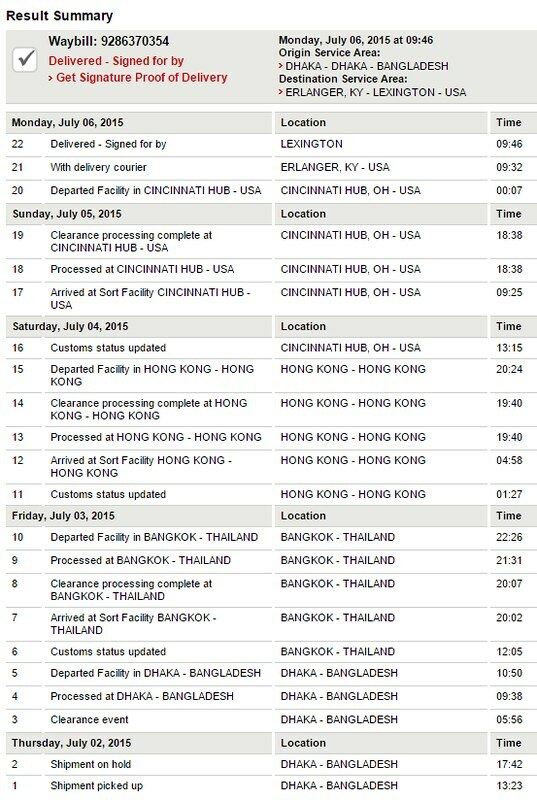 DHL has so many criterias to meet before shipping the device out. It feels like a big hassle to me. Why you sent me the wrong product? Also as I’m returning order number 107-5058894-2509844 I’m returning 107-8491469-9101817 too, which I bought as an supplement for the MP3 player and would not be needing any more. I will update you once I ship them out to you. It is so tiring, frustrating expensive. 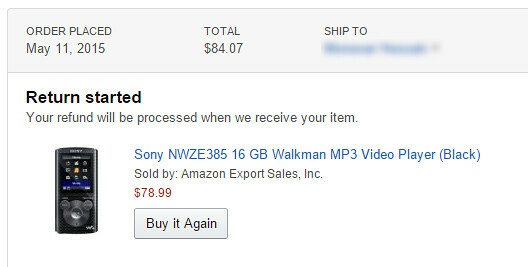 Then I actually managed to ship that back to Amazon through DHL on 2nd July. Actually Bangladesh has some restrictions to ship something out! FedEx refused to receive that and ask me to bring some ministry clearance. DHL also told me that if the battery in the device is Lithium-ion, they will not accept the item as they have Lithium-ion explosion experience!! I told them it contains Nickel–cadmium battery. Well honestly I could not find it on the manual and to ship it out I just made it up on the spot. I’m sorry to know about the problem you had in this case. I understand your concern that it’s a huge hassle for your to send it back to us. This is not what we want our customers to experience and I will definitely help you with this. To avoid any inconvenience, as we don’t like to waste your precious time, there’s no need to return the item you received. You’re welcome to keep, donate or dispose of it–whichever option is most appropriate and convenient for you. 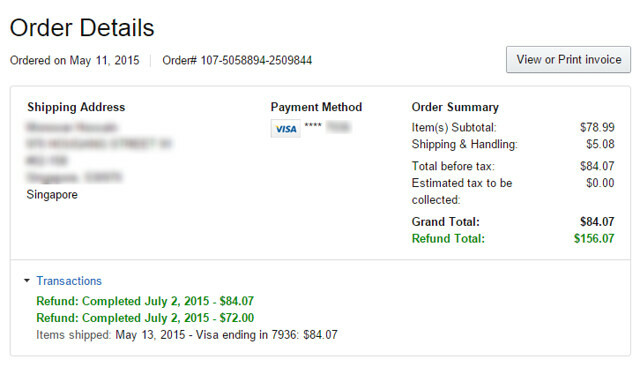 As per your request, I’ve requested a refund of $84.07 to your Visa card. I hope this helps, we look forward to see you again soon. I understand that you’ve received a wrong item in your order #107-5058894-2509844 and this is really troublesome and frustrating to return the wrong item. I sincerely apologize for the inconvenience this has caused to you. I have checked and found that a refund of $84.07 has already processed for this order and you’ll receive that in your credit card with in 2-3 business days. You may return the item as per your convenience and let us know the return shipping cost, so that we can reimburse you the same. Please give sellers two business days to respond. In most cases, you’ll receive a reply much sooner. When the seller replies, you’ll be able to respond directly to the seller’s e-mail. However, in this case, if do not want to go through the hassle of returning the item of order #107-8491469-9101817, I suggest you to keep or dispose of the item and we’ll issue a $5.68 promotional certificate to your Amazon.com account, which will automatically apply the next time you order an eligible item sold and shipped by Amazon.com. The promotional certificate doesn’t apply to items offered by other sellers on the Amazon.com website and won’t cover the purchase of gift cards, sales tax, gift wrap, or additional shipping costs. I hope this helps. I hope to see you again soon. They have charged me Taka 5540, which is equivalent to 72 USD according to XE.com. Would appreciate if you can take care of this too. I’m sorry for the inconvenience caused to you with the recent order. Thank you for understanding in this regard. We look forward to seeing you soon. Well after this I have received some refund confirmation emails and also checked the DHL tracking number and found it’s delivered on 6th of July. The only reason I am sharing this long story with you because I wanted to let everyone know how loyal and professional a service provider could be. E-commerce business has great opportunity in Bangladesh but are they committed to their customers?